These four cancer-fighting spices have powerful health benefits and were part of my daily regimen to beat cancer without chemo. They are common, but not commonly found in American cuisine, so I had to be very deliberate about adding them to my food. 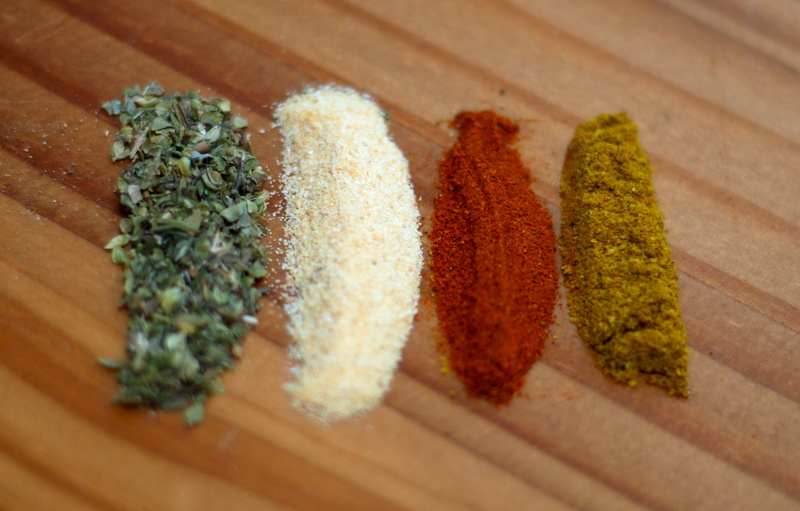 I took copious amounts of these four spices and still do today. They are: Organically Grown Oregano, Garlic, Cayenne Pepper, and Curry Powder. Curry Powder is actually a mixture of spices and typically contains Turmeric, Coriander, Fenugreek, Cumin, and Red Pepper. Turmeric is the business because it contains the active cancer-fighting ingredient Curcumin. The Turmeric plant is a relative of Ginger and has been used for thousands of years in Indian Ayurvedic medicine (the science of long life) as an antiseptic and antibacterial agent to treat infection, inflammation, wound healing, poor digestion, etc. And as you may know, it is also a staple ingredient in Indian, Persian, Thai, and Malaysian Cuisine. Curcumin has been clinically shown to inhibit growth of various cancer cells including: Bone Cancer, Breast Cancer, Brain Tumors, Colon, Liver, Pancreatic, Stomach, Bladder, Kidney, Prostate, Leukemia, Ovarian, Melanoma, and more! One of its anti-cancer benefits comes from its ability to induce apoptosis (natural cell death) in cancer cells. Oregano has extremely high levels of antioxidants and antimicrobial compounds. One teaspoon of oregano has the same antioxidant power (ORAC) of two cups of red grapes! It contains the phytochemical Quercetin, which is known to slow cancer growth and also promote apoptosis (there’s that word again). And on top of that Oregano is a good source of Vitamin K and Iron. Garlic is a very powerful anti-cancer spice. Studies all over the world have shown it to lower the risk of developing all types of cancers especially colon, stomach, intestinal, and prostate cancer. It has strong antibacterial properties as well as the ability to block formation and halt activation of cancer-causing substances. It can also enhance DNA repair; slow down cell reproduction and, like Turmeric and Oregano, induce apoptosis. The World Health Organization recommends adults have a daily dose of fresh garlic (approximately one clove). So not only did I put garlic powder on everything I ate, but I also chopped it up raw garlic cloves into little bits and swallowed them like pills. Did I reek of garlic? Oh yeah. Did I care? No I did not. Cayenne Pepper contains Capsaicin, which is the active compound that sets your lips, tongue, and everything else on fire. Turns out Capsaicin is also the stuff kills cancer cells, causing……………..can you guess it? Cayenne is also a key ingredient in The Master Cleanse for its detox abilities. The Hotter the Better: If you can handle the heat, Habanero Peppers contain 4-6 times more Capsaicin than Cayenne with a Scoville rating of 200,000 units. Yeeoow!!! The first time I ate a super hot chili pepper was on a dare, my friend Brad Stanfill bit half and I bit the other half. It was so hot I couldn’t think straight. I don’t know if it triggered endorphins or adrenaline or what, but I was buzzing and somehow ended up lying on my back in the grass in our front yard until it wore off. Here’s a super easy way to add more spice to your life: I use all four of these cancer-fighting spices in a salad dressing I make from scratch. Read about it HERE. Questions, Comments, Spices ? Post them below! And click that “like” button down there if you liked this post!